PGently place eggs in a medium saucepan and add cold water to cover. Bring just to a boil over high heat. Remove saucepan from heat and cover tightly. Let stand for 12 minutes. Pour out hot water from saucepan and replace it with ice water. Let eggs stand until chilled, about 10 minutes. Crack eggs. Starting at larger end of each egg, and working under a thin stream of cold running water, remove shells. Cut eggs in half lengthwise, scoop out yolks into small mixing bowl and arrange egg whites on serving tray. 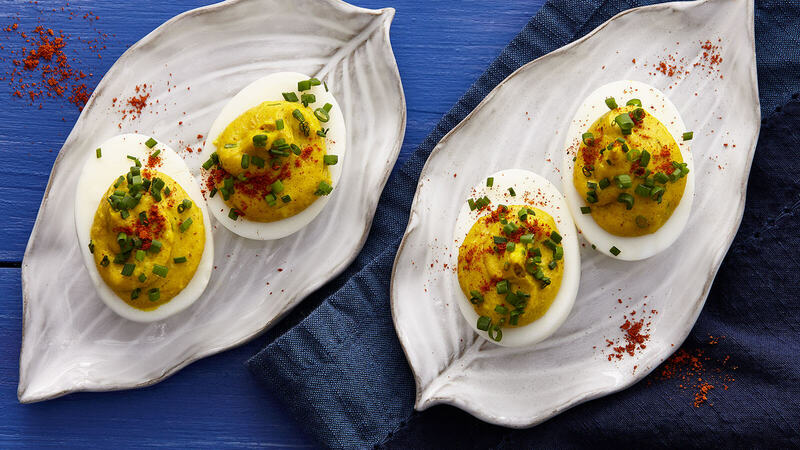 Blend yolks with all remaining ingredients except cayenne pepper. Ideally use a hand mixer. Put mixture into piping bag, and pipe into egg whites. Lightly dust with cayenne pepper and serve.